It’s hard to say we don’t want more rain, but more and more we’re saying just that. We’re having showers nearly every day or every other day, sometimes as much as an inch and a half. 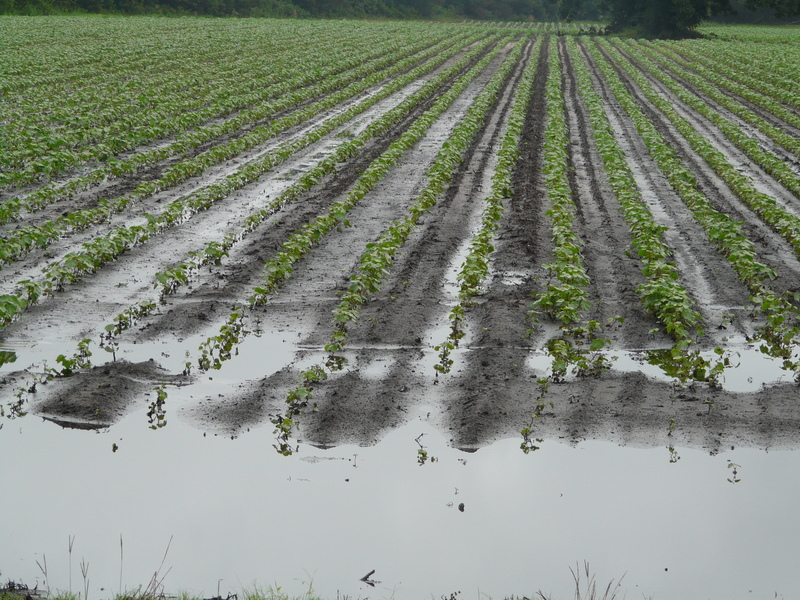 It’s starting to show up in the field where cotton is getting ‘wet feet.’ Some of our rain has come with strong winds. 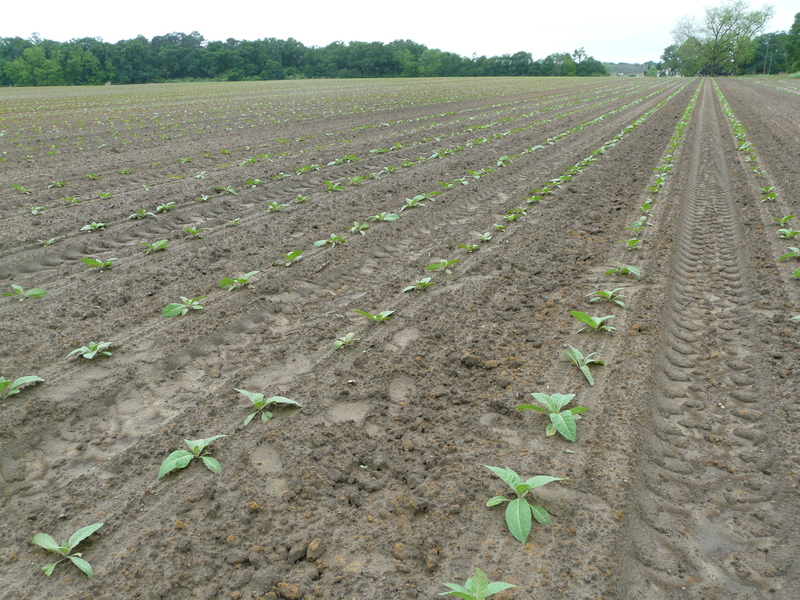 Our largest field of tobacco took a hit from these winds knocking plants to the ground in some places. The only hope is to stand it back up as best as possible. It is still causing issues with topping since the flowers on the ground began growing straight up. 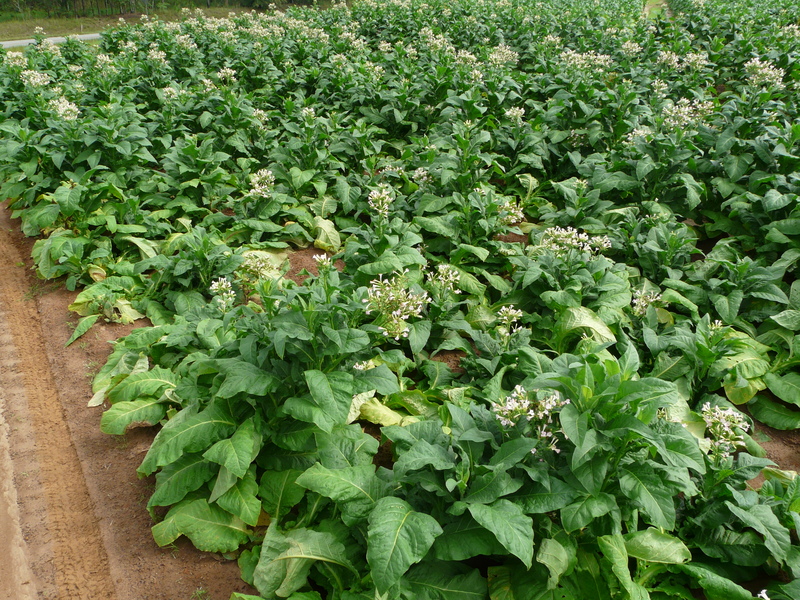 We have a good crop of tobacco this year, but it was hit hard from strong winds and rain. Some areas completely blown to the ground. 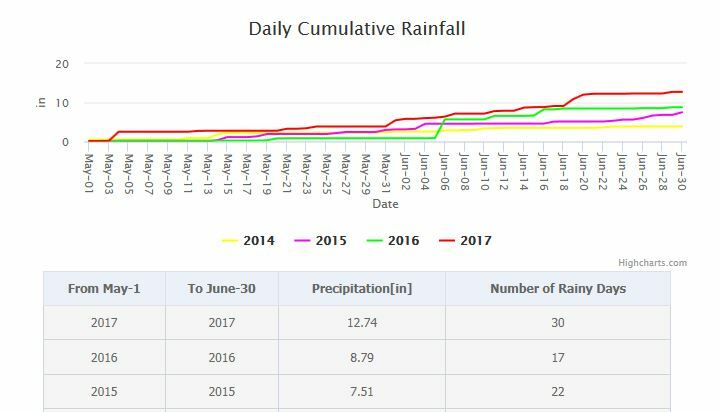 From UGA weather station in Cairo, here are the rain numbers since the beginning of May. Southern Corn Rust: I was stunned when agents in our disease diagnosis class visiting a field in Morgan County found a very active spot of southern rust. Unbelievable because until yesterday, it had ONLY been found lightly in Seminole and Marion Counties. Obviously, as we expected, southern rust could be present anywhere in Georgia now. Why it has not “exploded” yet is a mystery to me given the conditions we have had, but CLEARLY the spores have spread across the state. The corn in that field as at hard-dough/early dent, so it does not need to be treated; however growers with later planted corn not yet at R6/dough stages should be aware there is at least some threat. Target spot of Cotton: Perfect weather but I am NOT calling for an automatic fungicide application at first or at third bloom. BUT I am saying that every cotton grower SHOULD be aware that these can be important and critical timings. As cotton approaches bloom, I hope growers can put some eyes and boots in the field and begin looking for it, lower leaves first. Weather is very favorable- growers with a history of disease in the field and those with high-input, strong yield potential should be the growers with the greatest chance for benefit. Target spot will not steal the entire crop, but it will take away a valuable portion of the crop. Consider: Growth stage (blooming yet?) history of disease, reports from scouting, (have early symptoms been found? ), what’s the weather like now and what is the forecast? What is the value to the growing in a preemptive application “to be done with it”? 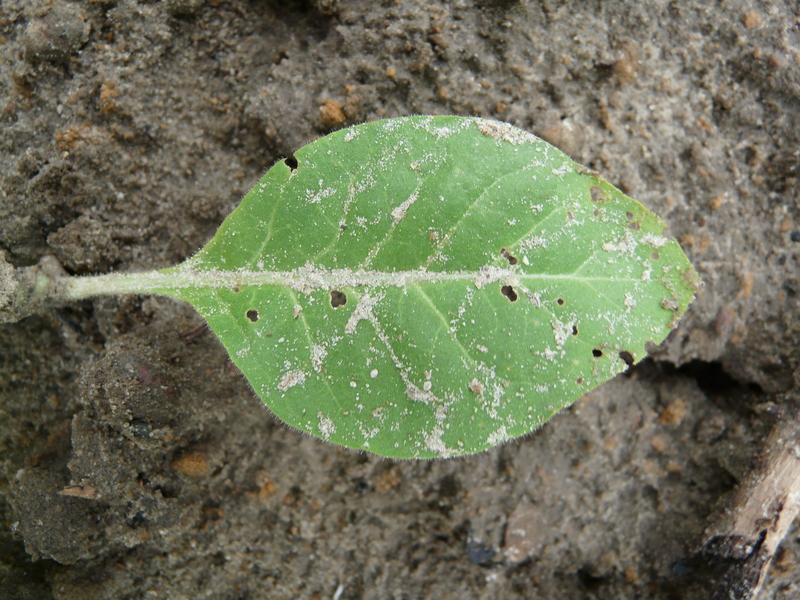 White mold and leaf spot in Peanut: We are seeing some of both. Growers, don’t get behind! 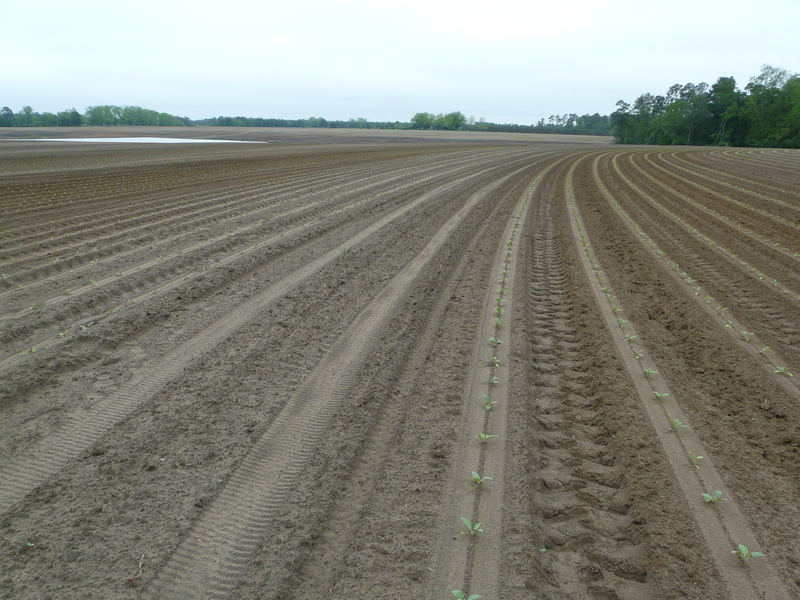 All tobacco in the county has been transplanted in what they say has been the best transplanting conditions in a year long time. Transplanting started for us March 31 and finished up a few days later. 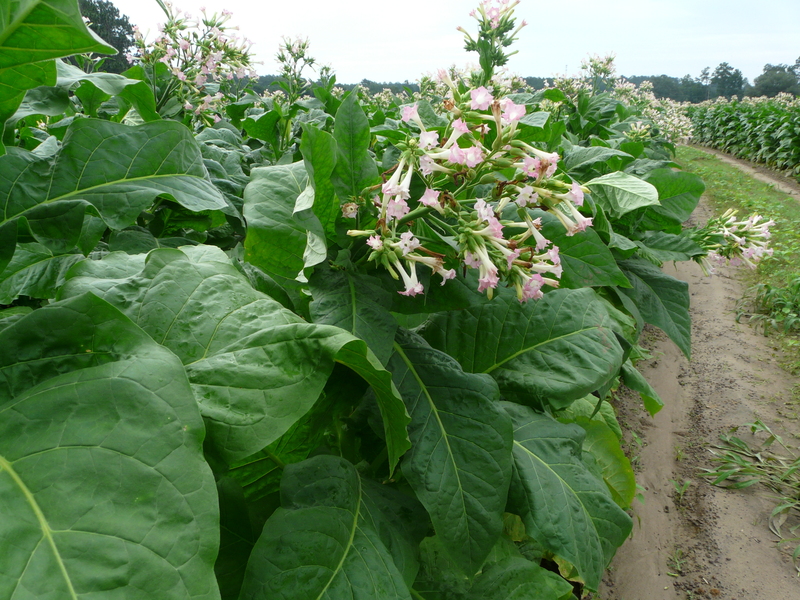 UGA Extension Tobacco Specialist Dr. J. Michael Moore came down Wednesday and we got to see everything that was set. Below are some pictures of the fields. 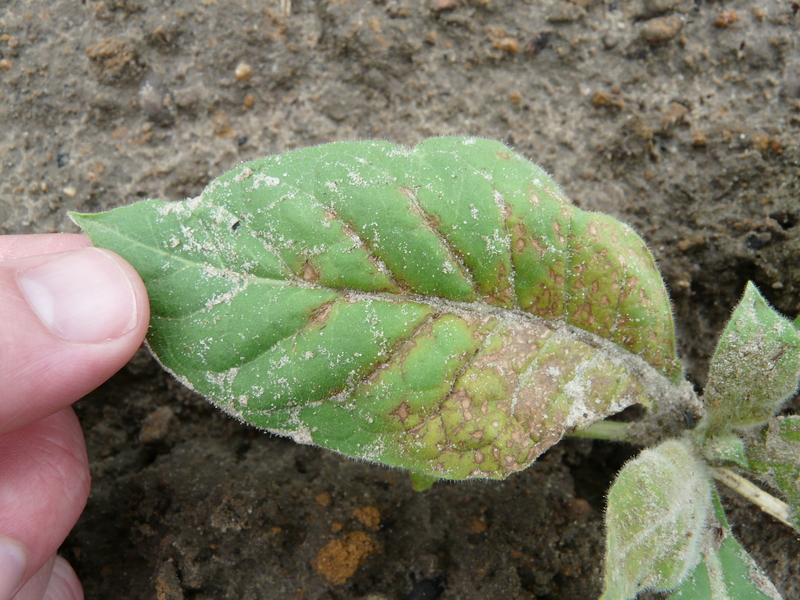 In one of the earliest fields, Tomato Spotted Wilt Virus has showed up in a hand full of plants. It has been two weeks to the day of transplant, and Dr. Moore says two weeks is the magic number for TSWV. You can see the reddish-brown necrotic ringspots and also where the bottom half of the leaf stops growing and the other half continues to grow, the leaf will distort. Even immature thrips are present in other fields and field edges which means they are not only out, but reproducing. Virus was showing up only on the edge of this field that also has pecans surrounding it. We also saw a little chewing in the leaves from flea beetles. Greenhouse treatments usually control flea beetles. Field treatment for young plants starts at 4 beetles per plant.